Obviously, there are more than just 7 of them. We traced and identified the 7 as visited by WaterfallQuest few years back. There are also more in between but are not labeled, adding to the fact that labeling itself is not something precise. Note: We couldn't confirm the names Jeram Antu and Jeram Enchau (1st and 2nd falls respectively) to be official at this time. There are no official trail markings to any of the waterfalls. However, the trail to 1st fall is clear; notwithstanding that, you still need to know which forked trail to take in order to get there. From there to 2nd onwards, pathfinding is required. There is river trekking involved just as much as cutting through raw forest with steep, soil terrains. To anyone wanting to do that, please be extreme careful, especially during rainy days. The slopes will be challenging and rivers will be unforgiving. Waterfall types: Cascade (1st, 2nd, 4th, 5th, 6th), Punchbowl (3rd) and Segmented (7th). Practise LNT in your entire trip. 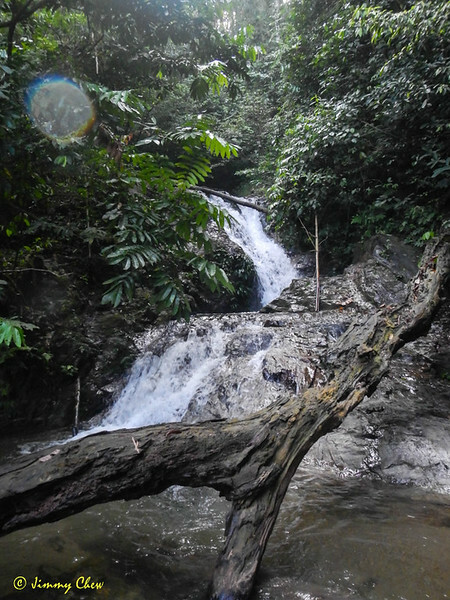 2nd falls - Jeram Enchau.